There is a long standing dispute as to whether the humble Pavlova originated in New Zealand or Australia; it seems to be New Zealand who can take claim to fame for this popular Christmas dish (read more here) but I can bet you Aussies will say otherwise. 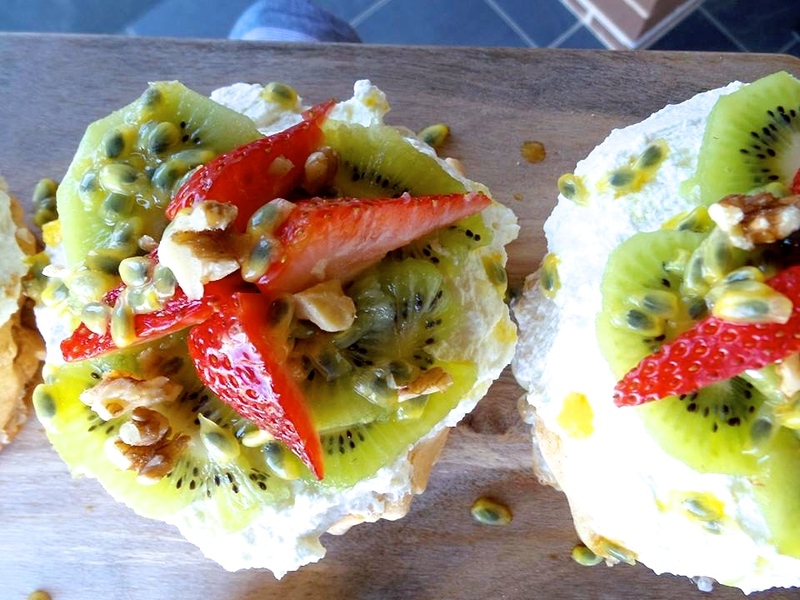 Regardless of where the Pavlova originated from we can all agree that they are delicious! This recipe is inspired by Sovereign and their #lifetakecharge mantra. Here, I'll show you how to take charge of Christmas and enjoy a traditional festive treat without all of the additives! Most Pavlova recipes call for additions of ingredients such as vinegar, corn flour, icing sugar and a whooollee lot of castor sugar. I have tried to make these mini pavs as low in sugar as possible, however, there still needs to be an element of sugar in the recipe for the meringues sake, so in this case I have opted for Norbu - a natural sweetener made from Monk Fruit. Libby has given us some tips on reducing our sugar intake and I have another to add to her list - When baking replace refined sugar with natural sugars. There are plenty of natural sweeteners available at the supermarket or your local health food store so if you are a regular baker little changes like this can make a big difference over time. I have topped my mini pavs with cream to keep them traditional but if you are dairy free try a coconut yoghurt or goats milk yoghurt (generally suitable for people who are lactose intolerant). The addition of walnuts on top add a nice crunchy texture that compliments the chewy meringue really well. 6x egg whites 1/2 cup sugar (I used norbu - stevia would also work well) 1 cup full fat organic cream 1 tsp pure vanilla essence 1 punnet of strawberries, sliced. 3 kiwi fruit, sliced. 2 passion fruit (to drizzle over top) Handful of chopped walnuts. 1. Pre heat oven to 160 degrees celsius/fan bake. Line a tray with baking paper. 2. In a bowl whisk the egg whites until they hold firm peaks. Then slowly add in the sugar whilst still mixing. 3. Spoon egg white mixture on to baking tray in circular shapes. Place into the oven and cook for 30 minutes. 4. Once cooked turn the oven off and leave cooked pavlovas in the oven with the door ajar. 5. Time to prepare the cream. Add cream and vanilla essence into a bowl. Whisk until nice and firm. 6. Once the pavlovas are cool spoon on cream and flatten out/smooth over with a spatula. 7. Decorate with kiwi fruit, strawberries, passion fruit and chopped walnuts. If you wish to make the pavlovas in advance they will keep for about 4 days in an airtight container. Only decorate with cream and fruit on the day that they will be eaten otherwise the liquids will cause the pavlovas to soften and crumble.